The tournament will have two stages. Stage 1 for Qualification. Stage 2 for Main draw. There is no limit to the number of entries in the Stage 1 but only 64 men and 32 women will qualify for Stage 2. Players who are eligible for the Stage 2 must forward their nominations to the committee within 15 days before the qualifying competition. The committee will penalize players who failed to participate once their nominations have been accepted. All Mainland Chinese players (regardless of Qualifying Rounds or Main draws) are required to complete their nominations and make payments via the China Billiards Association app. Unpaid nominations will not be accepted. No refunds will be given once the nominations have been accepted. No telephone or on-site nominations will be accepted. Overseas players (regardless of Qualifying Rounds or Main Draws) must complete the nomination forms and send a email to cbsa@sports.cn before the deadline; Players from Hong Kong, Macao and Taiwan must complete the registration via the official app. Players who wishes to wear logos of their sponsors must email the name and the pictures of the logo to cbsa@sports.cn before the closing date. Each player is entitled one logo each. WPA 9-ball rule with the 3 point break shot rule. Magic sheet will be used to rack the balls with 9 on the spot. (The 1 ball is placed at the top of the diamond). There are 3 matches in Stage 1. Single elimination with men players race to 9 and women players race to 7, 4 best men players and 2 best women players from 1st and 2nd matches, 8 best men players and 4 best women players from the 3rd match respectively advance to stage 2. No seeded players for stage 1 and all the matches are winner break. Stage 2 is run in two rounds. In Round 1, Double Elimination. In Round 2, Single Elimination . 64 men players play on 8 groups double elimination system and 32 women players play on 4 groups double elimination system. 4 men players each group (2 from winning racks respectively and 2 from losing racks respectively) and 4 women players each group (2 from winning racks respectively and 2 from losing racks respectively) advance into Round 2. Stage 2 Double Elimination, Men players race to 9. Women players race to 7. Single Elimination, Men players race to 11. Women players race to 9. Final, Men players race to 13. Women players race to 11. All the matches are alternate break. NO seeding for Round 1 double elimination. Round 2 single elimination will be seeded in a crisscross formation according the result of Round 1. (If the results are same then will draw first) Players from the losing racks will go into free draw situation. Players should make break within 45 seconds. Each player can request 45 seconds longer to make break in each game. The referee will give a warning once in the last 10 seconds. The last 5 seconds will be countdown. There is no shot clock in the last rack. There is no time out for the Stage 1. In the Stage 2, men can request time out after 8 rack and the women after 6 rack in each match. The time out is 5 minutes. These prize monies are pre-tax amounts and recipients are obliged to pay 20% tax in accordance with the state tax laws. All the players are responsible for all their own expenses occurred during the Tournament. Entry fee payable is 1,000RMB for the Main Draw and 400RMB for the Qualifying Rounds. 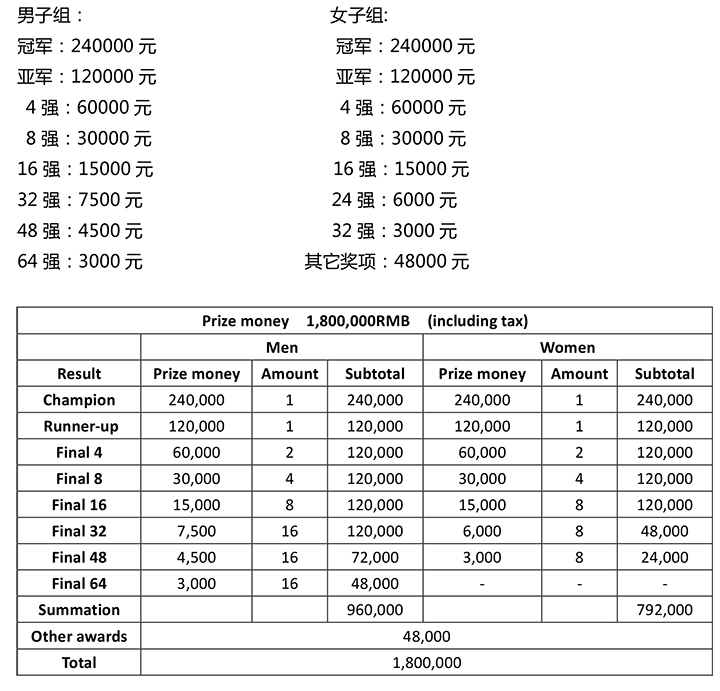 Players who have passed the qualifying competition to qualify for the main draw must pay another entry fee of 600 RMB. Qualifying players and main draw players pay the entry fee when they register on the official APP. The qualifiers will pay the entry fee on site. Main Draw players must be properly dressed for the while attending the draw and the opening ceremony. All players must adhere to the dress code during the competition. The Organizing Committee has the right to forfeit any players not conforming to this. Men may wear a short sleeved collared or polo shirt which is tucked in with dark dress pants and black leather shoes. Women may wear a short sleeve collared or polo shirt, an elegant top, a dress or a blouse which is covering the shoulders with dress pants or skirt which must cover the knees. Shoes must be elegant dress shoes that match the outfit. Players must report to the Tournament Director 15 minutes prior to the match to ensure that the dress codes and logos standards are met. Players must be present at the entrance of the hall 5 minutes before the match before being led away by the referee. Players will be forfeited if they failed to show up at the venue at the commencement of the chief referee’s announcement. If a player needs a decision to be taken, the first person to be contacted is the referee. The referee will form his decision by all means that seem suitable to him. If the player wants to protest against that ruling, he may contact the head referee and after that the tournament director. In any regular tournament, the tournament director’s decision is binding and final. The rules and regulations give the referee and other officials considerable latitude in penalizing unsportsmanlike conduct. Several factors should be considered in such decisions, including previous conduct, previous warnings, how serious the offense is, and information that the players may have been given at the Players’ Meeting at the start of the tournament. The wearing of advertising or logos (5cm x 8cm) on a player’s attire may be restricted. Generally the CBSA allows players to wear advertising that are in accordance with moral and ethical standards, not linked to any brand that is deemed illegal by law without express approval in writing. Players are not allowed to engage in any commercial events or promotional activities without approval from the organizing committee,. Players must wear the sponsor’s logo as specified by the organizing committee. Smoking and consuming of alcoholic beverages are not permitted during the match. This includes time-outs and other delays. Players are not allowed to use their mobile phone during the match. Mobile phones must be turned off and may not lie on the table or in any other visible spot. Off-site guidance is prohibited during the competition. Any form of gambling is strictly prohibited. Any violation of law and morality is prohibited. Violators will be disqualified. The interpretation of this rules and regulations belong to the CBSA.